You guys, you guys! Read this book! 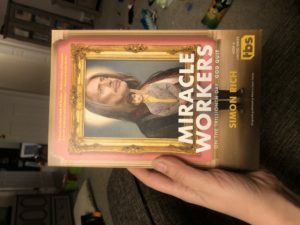 Read all of Simon Rich’s books, but read this one first. I hadn’t known until finishing this one that he wrote for the Simpsons, but it made sense. This is witty without being highbrow, fun without being lowbrow. I read it in one sitting (or as close to one sitting as I get these days, I read it in two kraken naps in a 24 hour period so I’m calling it.) It’s like first-ten-season-Simpsons mixed with NPR had a baby with Good Omens, and I’m not sure I could praise something more if I tried. I fell in love with Rich’s writing after an NPR reading of his story written from the perspective of an unused condom in a boy’s wallet, and he’s now on my “buy the phone book if his name is in it” author list. The story involves two angels in God’s Office-Space-like heaven and their efforts to keep their distracted boss on task, even when he’s tempted to scuttle earth in favor of heaven’s first Asian fusion restaurant. I know that sounds twee, but this didn’t disappoint, and I thoroughly enjoyed the story, even if I have to concede that – while a worthy heir to Good Omens – it didn’t make me laugh out loud the way Gaiman and Pratchett did. It’s sweet, and charming, and the second best story about the apocalypse I’ve read. If any of my reviews have made you tempted to try a new author, let it be this be the one. Share the post "Good Omens meets NPR"
I’ve been enjoying the TV show and knew it was based on a book but forogt. Thanks for the reminder – I’ll have to check it out.